It was before 9:00am when we arrived at the green area just off the Florida Turnpike. 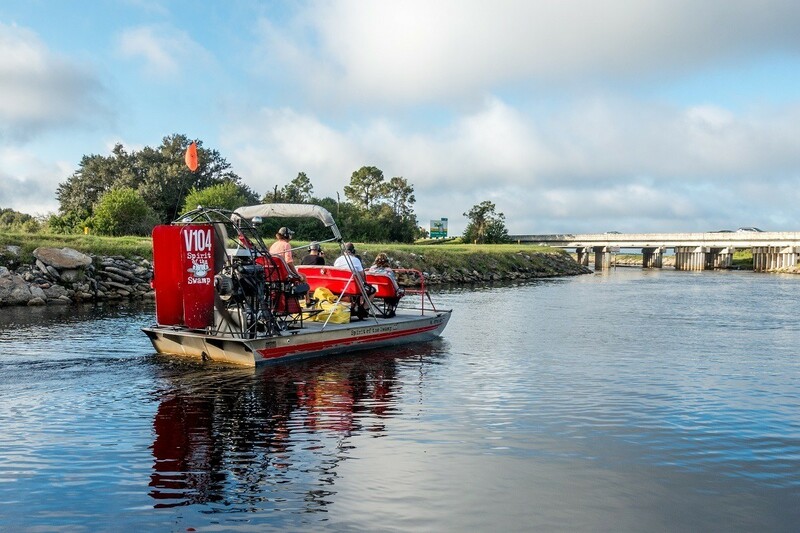 The morning fog still lingered in the air as the row of red-and-white airboats came into sight in the canal. Though I was less than a half-hour from Cinderella’s castle and the alleys of Universal’s Hogwarts, it felt like a very different world as we approached the dock to meet my Spirit of the Swamp captain. 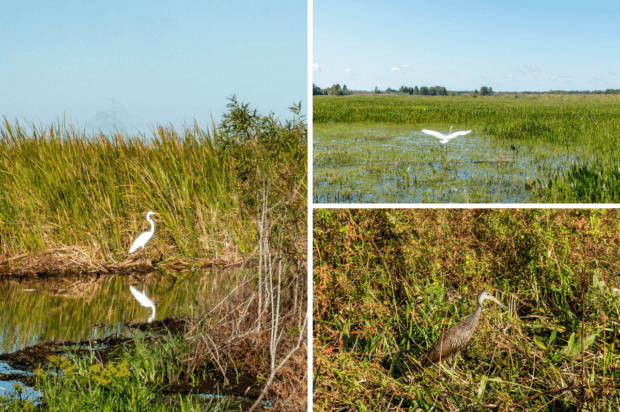 And it was time for a very different kind of ride than we’d been doing at the parks, too—it was time to see the natural beauty of Kissimmee in an airboat. 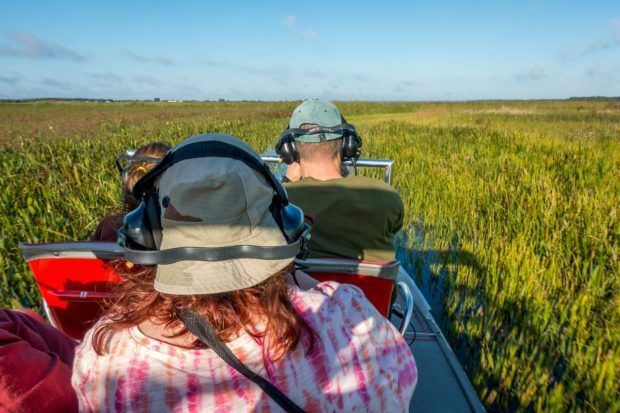 After a brief orientation, our group of five climbed aboard the airboat, donned our headsets (to block some of the boat noise and to hear the captain better), and headed for Lake Tohopekaliga. As we glided over the lily pads and passed the mounds of floating grasses, our captain explained that much of the area we were in had once been cow pasture but is now swamp. 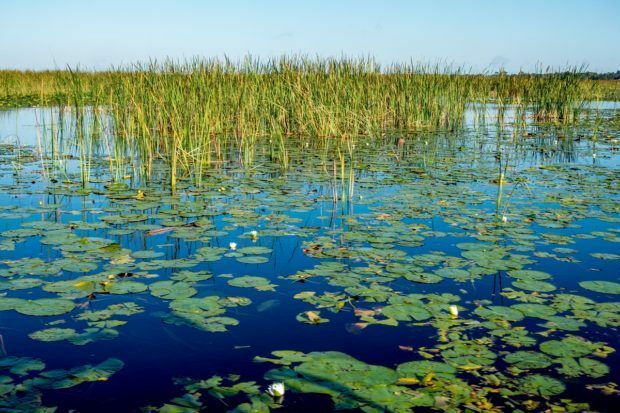 We were in the headwaters of the Everglades. Our first sighting came within just a few minutes as a bald eagle swooped by and landed at its nest on the top of a nearby tree. That was really all it took to get everyone excited. Over the next 90 minutes, we saw what seemed like dozens of bird species. Brown limpkins perched on fence posts—markers of the old cow pastures—with apple snails in their beaks for breakfast. Great white egrets perched on the grasses waiting for prey to pounce on. Cranes took flight when our large, whirring craft got a little bit too close for comfort. Through it all, our captain narrated every action, educating us all about the wildlife of the marsh as Spirit of the Swamp became an entertaining classroom for the morning. At the same time we watched the birds, we scrutinized everything that moved in search of an elusive alligator. We went to all the usual spots, checked all the typical inlets and islands and places where our captain said “they’re usually right over here…” But it was just one of those mornings when nature was even more unpredictable than usual. But then our fortune turned. Our time was nearly up when the captain spotted the black eyes peering out through a tangle of plants. There she was—an 8-foot female vigilantly guarding her nest. She wasn’t troubled by us at all and just sat staring in her perch among the leaves. The boat stopped and we excitedly removed our headsets to gaze over the side of the boat and listen to more about these creatures that are treated with equal parts fear and awe. We learned how alligators nest and how they raise their young and about the popular hunting season and regulations in this part of Florida. And we stared. 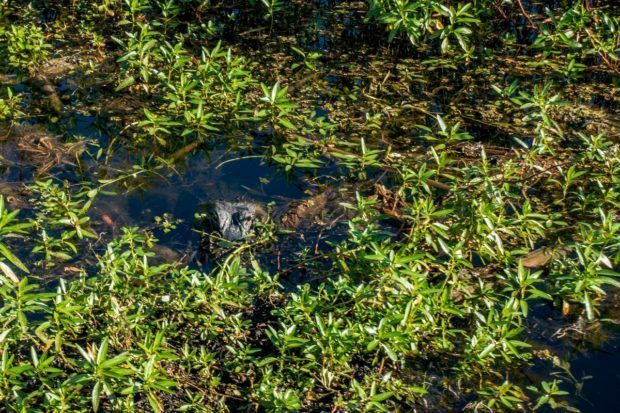 We weren’t quite sure what we were waiting for, but we were transfixed in the gator’s dark gaze. After a few minutes, it was time to move on, time to learn more about the water lilies and Spanish moss. There were more striking Cypress trees to see and more vultures to watch circle nearby. 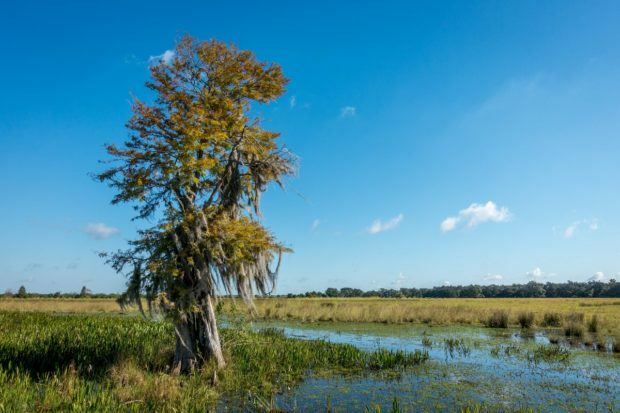 Because, although the holy grail of any airboat tour is the alligator sighting, there’s so much more to see in the swamp. See other fun things we did on our trip to Orlando. We were the guests of Spirit of the Swamp thanks to Experience Kissimmee. All opinions of the picturesque and peaceful are our own. 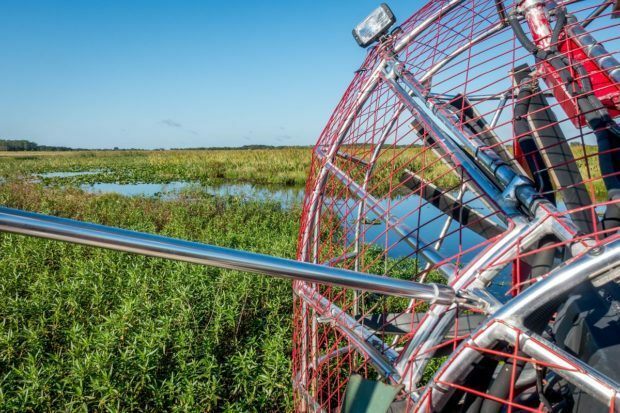 What do you think about Speeding Through the Shallows on a Spirit of the Swamp Airboat Tour? A swamp boat tour looks like so much fun. 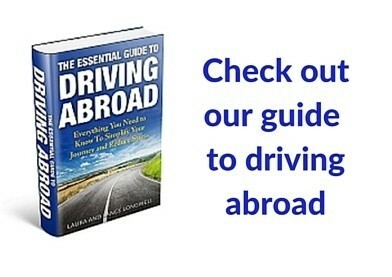 I’d love to do one in Florida.